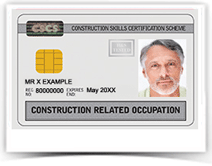 This card covers construction related occupations not covered by other CSCS cards and displays the holder’s occupation. The CRO card is valid until 30th September 2017. - From 1st October 2015 you must register for a nationally recognised construction related construction recognised qualification before the card expires. - Only one occupation will be displayed on the CRO card. - CSCS will stop issuing CRO cards from 31st March 2017. - All applicants must pass the CITB Health, Safety and Environment Test. To book the test please click here. To apply for the WHITE/GREY CSCS CARD please click here.